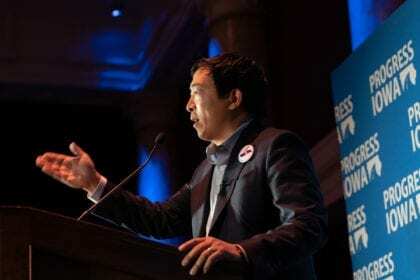 Presidential candidate Andrew Yang, whose central campaign pillar is “The Freedom Dividend” (a re-branding of Universal Basic Income, where all American citizens ages 18+ receive $1,000 per month), has unveiled his plan to enter the Democratic debates being held this June and July. On February 18th, Yang blasted out a call-to-action newsletter to his supporters, revealing exactly what it will take to get him onto the debate stage. Yang went on to discuss the new criteria released by the DNC. In addition to a candidate’s polling, the committee will prioritize accepting candidates who have shown they can raise grassroots money from individual donors. As of February 4th, Andrew Yang is already at 1% in at least one national Monmouth University poll. Yang has revealed that he’s also reached 200 unique donors per state in over 20 US states. Since the newsletter was released, the Yang2020 campaign has received an additional 4,000 individual donations. However, Yang still needs approximately 45,000 individual donors to meet the 65,000 unique donor mark. According to the DNC, they are currently preparing for a scenario in which there could be 20 or more qualified Democratic candidates for the first debate. If that is the case, the top 20 candidates will be selected using a method that favors candidates who meet both the polling and donation thresholds, followed by the highest polling average, then the most unique donors. If you would like to learn more about Andrew Yang’s campaign platform or make a $1 donation, visit his website. Dawn Howard has written 6 articles. Dawn is an anarcho-futurist, currently pursuing a Master's degree in Interdisciplinary Studies at NYU, with a focus on public policy and alternative socio-economic models. She is a volunteer writer and editor with Basic Income News. Man this guy is great ! It is good to see an Asian American run for the highest elected office of the country. Read my letters to editor in the Financial Times. I am not optimistic that he may even win the Primary.